Review: Superhero books for beginning readers. The recent deluge of superhero movies has resulted in a marked increase in superhero books and comics. Superman, The Justice League, Wonder Woman, and the Avengers are all slated to have new movies in the next couple of years. In this vein, I decided to look at superhero books for young children. 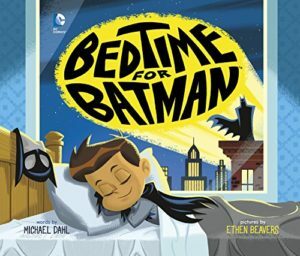 Good Morning, Superman, Be a Star, Wonder Woman, and Bedtime for Batman are a trilogy of books written by Michael Dahl designed to encourage kids in basic tasks such as brushing their teeth, bathing, and putting away their toys. Good Morning, Superman starts the series by introducing the early morning routine. A little boy leaps out of bed beginning his morning routine: potty, getting dressed, breakfast, and finally, tooth brushing. Presented alongside are depictions of Clark Kent/Superman going through his routine. Beginning his day as Clark Kent, flying over the city as Superman, fighting bad guys, facing Lex Luthor armed with Kryptonite (a nice touch alongside the little boys kryptonite colored toothpaste) and finally, ending his day knowing he helped keep peace within the city. 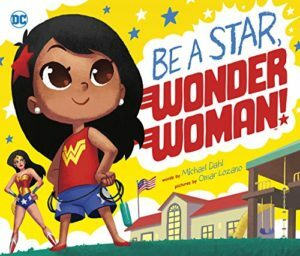 Be a Star, Wonder Woman goes further into the school routine and tackles more complex behaviors such as conquering fears, sharing with others, and learning to write. As with Good Morning, Superman, each of the child’s tasks is shown alongside Wonder Woman performing a similar superhero task. 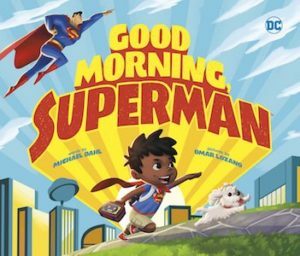 Where Good Morning, Superman encourages young readers with everyday tasks, Be A Star Wonder Woman helps kids with more abstract concepts such as courage, treating others fairly, and working as a team. Bedtime for Batman follows the same concept, juxtaposing the activities of the little boy getting ready for bed and Batman protecting Gotham. As the little boy begins his nightly activities (wearing Batman pajamas of course), Batman is watching over the city by apprehending criminals such as Harley Quinn, Penguin, and the Joker. The nightly bath is described as cleaning up the daily grime while toothbrushing is depicted as brushing aside his fears. Even the topic of potty training is tackled in such a way that young children will relate. Good Morning Superman, Be A Star, Wonder Woman, and Bedtime for Batman make a wonderful trilogy for toddlers and beginning readers. The text is simple, with an easy to follow storyline, and illustrations that play off each other nicely. Parents will likely find that any or all of these books become a nightly staple in their child’s bedtime routine but will also be granted the enjoyment of introducing a new generation to these superheroes.